The Plainfield Fire Territory Station No. 122 is the third of four stations designed by CR architecture + design in partnership with the Town of Plainfield, IN. Each station shares a timeless design and contemporary exterior that matches the local community aesthetics and unites the department’s identity through the varied use of brick masonry, metal panels and glass. A desire for the station to feel more like a residential space inspired the “Industrial Loft” design concept for Fire Station No. 122, which blends the comforts of home with the contemporary exterior by emphasizing clean lines and the use of industrial materials, such as epoxy, metal and wood. The station was also designed with sustainable initiatives in mind. The two-story station includes 12 individual dormitory spaces on the second floor, with a fire pole accessing the three drive-through apparatus bays. The first floor features additional living space, including a fitness room, study, media room and full-service kitchen with dayroom, as well as office and conference room facilities and the Dispatch Center. Maintenance and storage areas are crucial to the upkeep of equipment and vehicles, so shop space and EMS and SCBA storage space were all incorporated into the design to address this need, as well as dedicated turnout gear storage space. 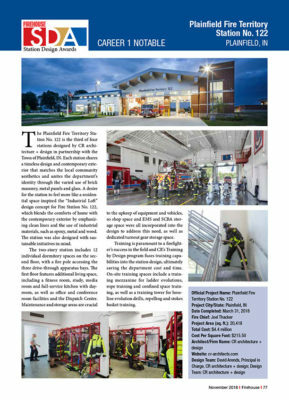 Training is paramount to a firefighter’s success in the field and CR’s Training by Design program fuses training capabilities into the station design, ultimately saving the department cost and time. On-site training spaces include a training mezzanine for ladder evolutions, rope training and confined space training, as well as a training tower for hose-line evolution drills, repelling and stokes basket training.